LEROSETT is BRAND 11 of our 12 Brands of Christmas and I have to admit it's one of my favorite all time brands. 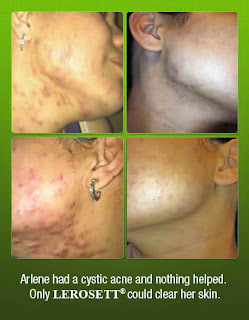 I have been using the LEROSETT Acne Clay Treatment for over ten years now. It's my "go to" for any sudden breakout and I love the fact that I can use it at any stage in my life...including now while I am pregnant! LEROSETT is a truly organic brand that actually works! It has been used and continues to be used...by millions of people daily and been recommended by leading dermatologist for over 20 years. The results truly speak for themselves. Check out these BEFORE AND AFTERS of pregnancy/hormonal breakouts. 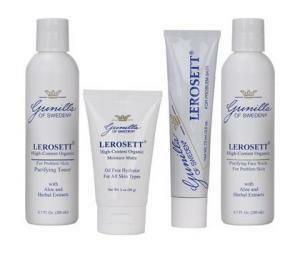 LEROSETT 100% Organic Acne Clay 2.5 oz: Many estheticians and dermatologists feel that if there is a cure for acne this is it!! If you check out our site the clay has several reviews and they are ALL Rated 5 stars! So many people simply CAN'T be wrong! LEROSETT (Oil-Free) Moisture Matte 2 oz: Organic acne moisturizer contains potent anti-inflammatory, anti-bacterial and anti-oxidizing agents designed to heal the painful symptoms associated with acne like swelling and redness. I started using this for the first time several weeks ago and love it! My husband borrowed it one evening and now he's using it daily too. It's fast absorbing, DOESN'T break me out, and I love the feel of the product! This kit is valued at $125! Wanna win? Visit our Facebook 12 Brands Giveaway Page for all the details and don't forget to follow us on Facebook for games, FREE SAMPLES, FREE PROFESSIONAL ADVICE, and MORE! !